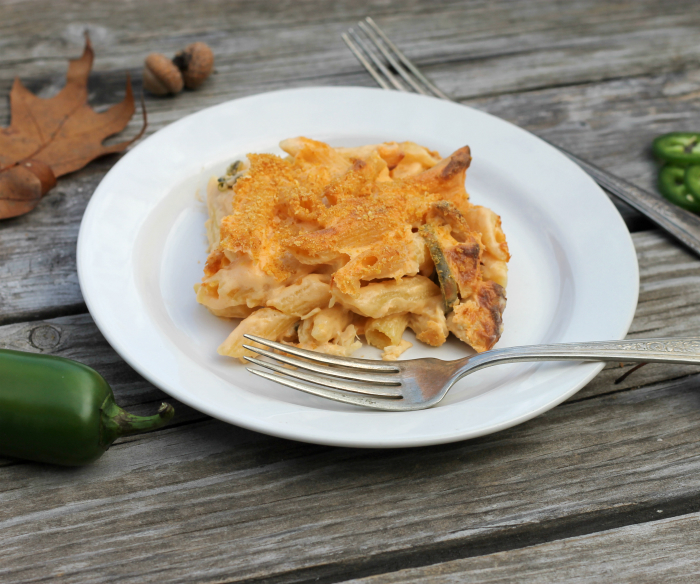 Jalapeno popper chicken casserole… the cool weather is here and it is time for some comfort food. I grew up on casseroles or as we call them here in the upper Midwest “hot dishes” or at least in the area I grew up in. My favorite when I was growing up was probably goulash. You know the one with ground beef, elbow macaroni and a tomato based sauce. We had it on quite often, I am sure the reason my mom made it on a regular basis was that everyone liked it in the family. I grew up in a large family with two sisters and four brothers, you know with that many kids in the family it is going to be hard to please everyone all the time, but I think that goulash was a dish that pleased everyone. We didn’t eat a lot of dishes that were spicy, or let me rephrase that we never ate dishes that were spicy when I was growing up. 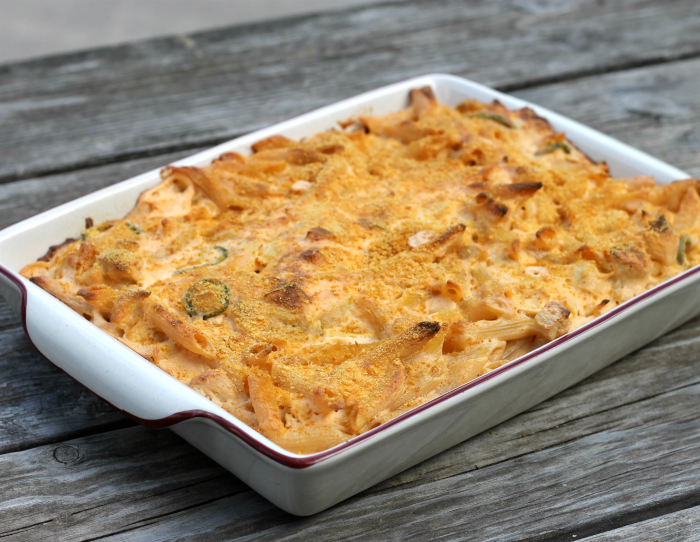 So a dish like jalapeno popper chicken casserole would have not been on the menu when I was a kid growing up. But I married someone that liked the spicy stuff, so I have definitely learned to like new foods. Bring on the spicy foods! Even my kids like their foods spicy. I got the idea for this casserole from our daughter Lisa. Her husband makes jalapeno poppers and she has been telling me how much she loves eating them. I asked her for the list of ingredients that her husband uses to make his poppers and I took it from there. 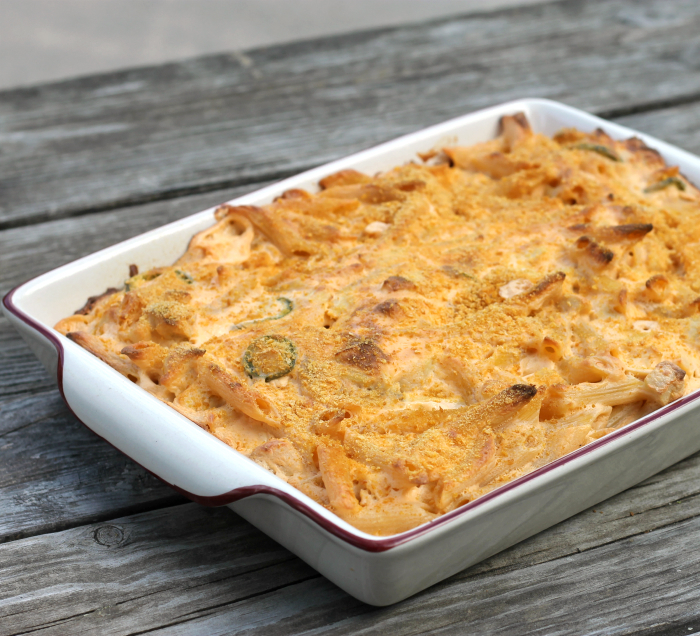 I love the flavor that the jalapeno pepper gave to the casserole. It was not overly spicy hot, so if you like it hot please feel free to add more of the jalapenos. Place the cream cheese and sour cream in a large skillet. Over medium heat melt the two ingredients together. Once they are melted slowly pour in the chicken broth and milk, stirring as you pour. Mix until all is blended well. Add the cheese and mix until the cheese is melted and blended in to the sauce. Sprinkle the onion and garlic powder over the mixture and blend in. Add the chicken and jalapenos and stir in until well incorporated. Mix in the pasta and season with the salt and pepper to taste. 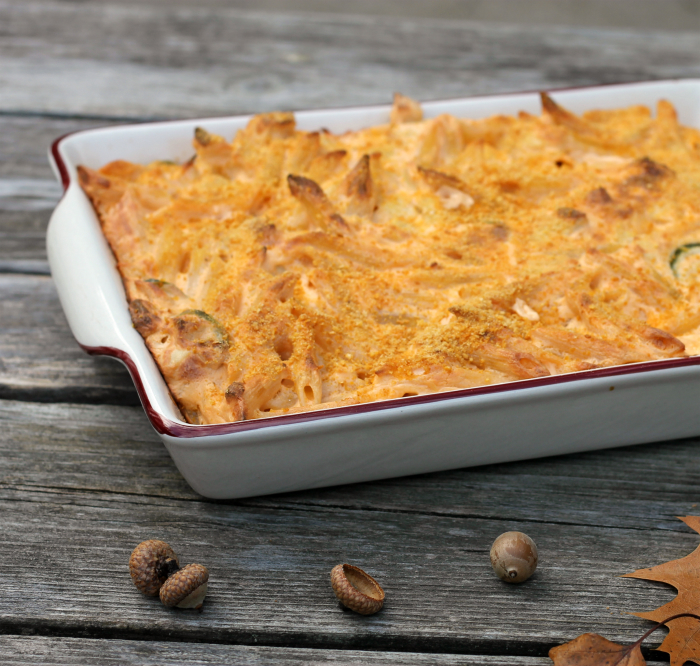 Pour the casserole into a 9 by 13-inch baking dish. Place the casserole into the preheated oven and bake for 20 to 25 minutes or until edges are lightly browned. Very nice idea. I can’t eat cheese but if I could, I’d reach in and grab a taste. Looks delicious, Dawn. Sounds like a great combination of flavors! Just the right amount of heat, I bet. It looks super comforting and tasty! Exactly what I would love for my dinner now. Hi Dawn, oh I love this casserole, pure comfort food.